What, another correction in gold? If you own gold you would like it to keep going up, forever, but that’s not how it works in real life. As I’ve stated many times over the last few weeks, the best result would be a retest of the April 15 lows, but not a violation of those lows, to allow gold to build the base necessary for a sustained rally. Friday’s action may indicate that we are close to that happening, or not. First, I sold May near the money calls against the gold shares I own. With gold shares down on Friday those calls have decreased in value, and if the action continues this week the calls will expire worthless at the close of trading on Friday May 17. That’s a good result for me, because I get to keep the premiums when I sold the calls. If the shares go way up this week, I either let my shares be sold, or I buy back the calls at a loss (but I still own the underlying shares, which will have increased in value, so I’m not too perturbed either way). I also placed an order for July GLD puts. 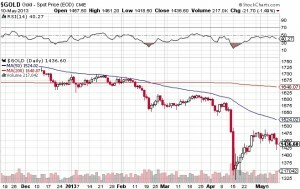 On May 8 I paid $1.35 to purchase GLD July $130 puts. They closed at $1.93 on Friday, so I have mitigated the drop in my gold shares with the increase in the value of my puts. I will let them run for the month of May, and if we have a capitulation day I’ll sell them and use the profit to buy more very-undervalued gold shares. 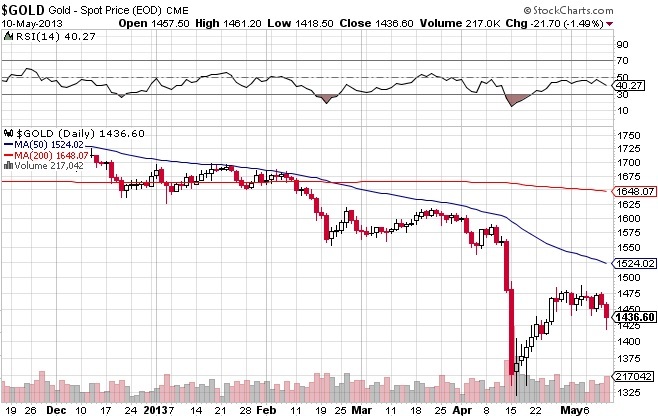 If gold goes up my puts may be worthless, but that’s the way insurance works; it’s only a good deal when you need it. Since there are no other interesting matters to report on since last week, I will keep it short and sweet.